The Casino Sky City & Hotel is located about 30 kilometers West of Albuquerque. In a friendly and welcoming atmosphere you will have the opportunity to try your luck on 640 slot machines featuring some of the newest and greatest games. A wide range of low denominations allow every budget to have fun. Thrills are part of the game around traditional table games like Blackjack, Craps, Roulette, and 3-Card Poker. A large and bright Bingo Hall is a place for big betting, big actions and big jackpots! Enjoy relaxing, comfortable and festive dining options inside the casino. Huwaka Restaurant, Huwaka Snack-bar or the Pinon Tree Coffee Bar are all making a great outlet to have fun few steps away from the gaming floor while eating fine food and drinking refreshing cocktails. Music shows and special events take place every weekend in the gambling venue and liven up your nights! A lovely and cozy hotel located right next to the casino is the perfect place to stay and remain close. Several services are at your disposal besides sophisticated rooms and suites. Located within Acoma Native American Pueblo in the New Mexico State, Casino Sky City is one of the ideal places to enjoy unique holidays with friends or your family in the region. You will especially appreciate the stunning view you have from the rooms of Mount Taylor and high-desert landscapes. The facility possesses a peaceful outdoor courtyard, seasonal heated pool and hot tub, and a fully-equipped fitness room. A gift shop sells Acoma local pottery and other local and home-made products. An outdoor amphitheater is the promise of memorable nights. Some of the major attractions in the surrounding include: the interesting Sky City Cultural Center which displays a part of the historical and cultural heritage of New Mexico. Fishing parties and tournaments take place in the Acomita Lake. Nature-lovers will stop by the Cibola National Forest, the Chaco Canyon, the El Malpais National Monument as well as El Morro National Monument to find beautiful natural wonders. 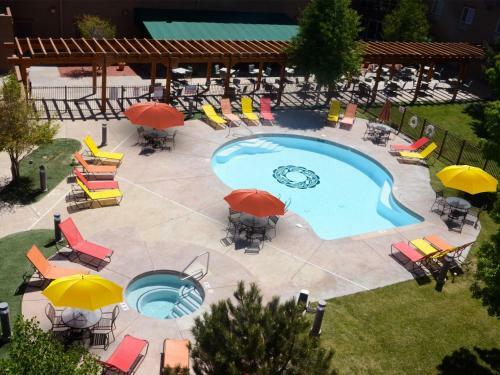 The place is only one hour drive from Albuquerque and its exciting attractions and thriving nightlife. Hotel & Casino are good, rooms are clean! Casino is small but it's ok.